One of the most recognizable groundcover plants that meet all the requirements is the lilyturf. Other names that this plant goes by is border grass, monkey grass, spider grass and liriope muscari (which is, in fact, the real name of the species). It is a perennial plant that is able to withstand a wide range of moisture levels, soil conditions, light intensity and other growth factors and because of that, it is a popular choice among the cultivars. It is characterized by dark green, graceful foliage that grows between 25 and 45 cm length-wise. If you are a fan of plants that combine low maintenance, pretty foliage and tough nature, you won’t be disappointed by having the lilyturf in your garden. What is more, you might be even surprised how well it can blend with the rest of the surroundings. In order to find out more about this groundcover plant and its proper maintaining, let’s go through the following steps. Liriope Muscari benefits plenty from fertilization. If you feed the plants with a slow-release fertilizer or organic plant compost in early spring, it will produce spikes of violet or white blooms in the summer. 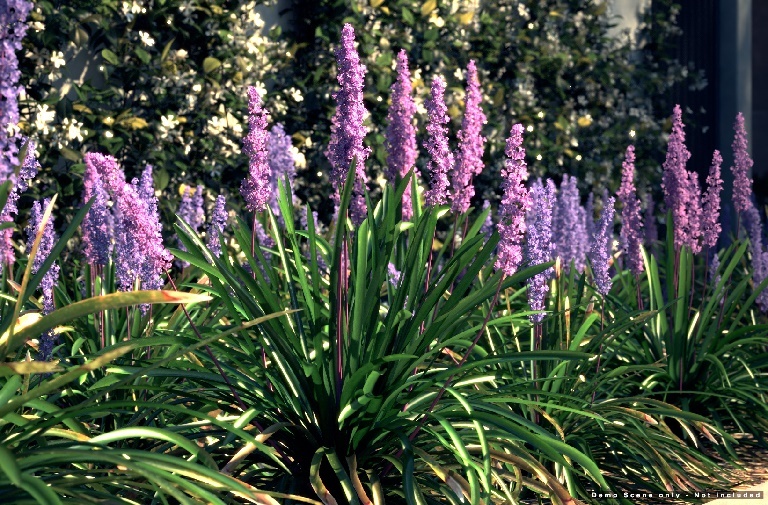 In order to thrive well, the liriope muscari needs a moderately acidic to neutral soil ranging from 6 to 7 on the pH scale. As most of the garden soils fall into the category of a pH range of 6 to 7, this plant can thrive well almost everywhere. In order to become established, the liriope muscari needs a consistently moist soil especially during the first season of growing. It shares the characteristic of other ornamental grasses as it doesn’t like constantly soggy or wet soil – this can lead to rotten roots and other diseases. So, the simple rule of thumb about the watering process is to deep soak the soil immediately after planting to a depth of at least 15 cm. Then, in the course of the first active growth season, the soil needs to be kept damp to moist, so there is no need for watering it every day. Once the plant is established, you should keep in mind that this is a very drought tolerant plant, so only if there are prolonged periods of summer drought, the plants will require supplemental irrigation. When it comes to pruning, all you need to do is mow or prune the plants to a few centimetres above the ground in late winter before new growth emerges from the ground. Pruning is important as it helps take out the battered leaves and permits new leaves to come in and flourish. Also, by pruning the lilyturf you enable it to grow healthily and fill in nicely. Finally, here are some extra bits of information about the subspecies of liriope muscari. You can go for the Liriope Muscari Samantha which has tidy clumps of deep glossy green and strap-like foliage and pretty pale pink upright flower spikes that turn into small black berries. Another one is theLiriope Muscari Big Blue which has rich purple-blue flowers. And finally, you can choose the Liriope Muscari Munroe White which has white flowers and looks wonderful when planted in bulk under taller trees. All of them are a perfect choice of an edging plant.